Make yourself at home in one of the 60 air-conditioned rooms featuring minibars. Rooms have private balconies or patios. Complimentary wireless Internet access keeps you connected, and digital programming is available for your entertainment. Private bathrooms have complimentary toiletries and bidets. 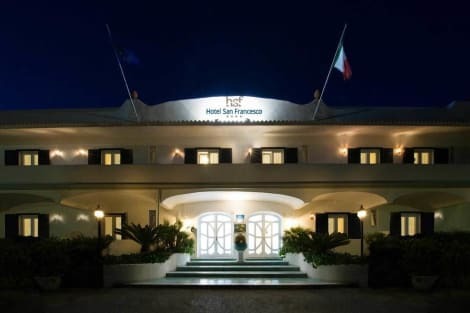 With a stay at Hotel San Francesco in Forio d'Ischia, you'll be near the beach, within a 15-minute drive of Poseidon Thermal Gardens and Chiaia Beach. 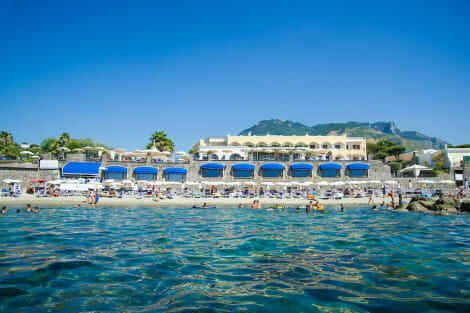 This 4-star hotel is 5.1 mi (8.2 km) from Ischia Port and 6.4 mi (10.3 km) from Aragonese Castle. Featured amenities include a 24-hour front desk, luggage storage, and an elevator (lift). Free self parking is available onsite. Relax at the full-service spa, where you can enjoy massages, body treatments, and facials. You're sure to appreciate the recreational amenities, including a health club, an outdoor pool, and an indoor pool. Additional features at this hotel include complimentary wireless Internet access and concierge services. Make yourself at home in one of the 75 air-conditioned rooms featuring minibars. Satellite television is provided for your entertainment. Private bathrooms with showers feature complimentary toiletries and bidets. Conveniences include safes and desks, and housekeeping is provided daily. Featured amenities include express check-in, express check-out, and complimentary newspapers in the lobby. Pamper yourself with a visit to the spa, which offers massages, body treatments, and facials. If you're looking for recreational opportunities, you'll find a health club, an indoor pool, and a spa tub. Additional amenities at this hotel include complimentary wireless Internet access, babysitting/childcare (surcharge), and gift shops/newsstands.